Landing a management position in big-time, professional football has to be such a bipolar experience. before we hang hodgson up on the cross, consider that it might not be all of his fault. On one hand, I would have to imagine you would probably be ecstatic to have landed a high profile job. The prestige, the perks, the chance to compete with and against the best of the best, knowing that you’ve reached the pinnacle of your profession… all of the things that make you want to go out and celebrate over a few pints. On the other hand, landing a high profile manager’s position must also be incredibly nerve wracking. The pressure, the weight of expectations of the directors/players/fans, knowing that you have a gun pointed at the back of your head from the minute you sign your contract… all of the things that make you want to go and drown your sorrows in a pint or ten. For most, the latter is often enough for us to rule ourselves out of contention for such a line of work… as if any of us are really that qualified. Of course, that doesn’t keep any of us fans, pundits and so called experts from crucifying those who do have that ambition and turning up our noses from our lofty positions as armchair managers. However, there is a small subset of the general populace that not only enjoys the great parts about becoming a manager, but also thrives on the negatives that scare the rest of us off. Without that pressure, the job wouldn’t even be fun for them. Unfortunately, most of the current men employed in these top positions the world over aren’t in this category. many of them are impostors, feigning fearlessness to land their “dream job,” only to quickly find themselves in over their heads. 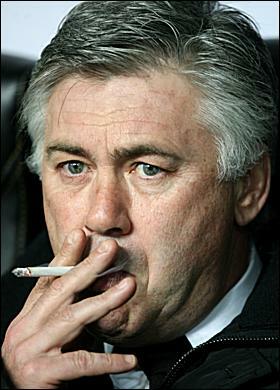 carlo deserves a cigarette... even top managers struggle from time to time. For every José Mourinho — ever cool as a cucumber despite taking on the most demanding jobs on the planet — there are ten Phil Browns, liable to bite your arm off because they’ve gone mad from the grind. And thus we have part of our explanation for the continuous carousel of management hirings and firings that are common place in the sport… each club desperately searching for their own Sir Alex, del Bosque or Bruce Arena (kidding). What can even be more frustrating though is even if you land one of those special managers, he just might not be the right fit. Whether it be he doesn’t mesh well with the players, doesn’t get along with the director. Think of Juande Ramos at Tottenham, Manuel Pellegrini at Real Madrid or Rafa Benítez at Inter Milan… sometimes it just doesn’t click. Then again, some of the above may have been the impostors I mentioned previously. Some of them may have finally succumbed to the pressure cooker and gone bananas (the Fat Spanish Waiter in particular). Maybe some were better cut out for serving mid-table sides, as was the case with Ramos and Pellegrini (Ramos with Sevilla, especially). It’s almost always a shot in the dark; a hope and a prayer. 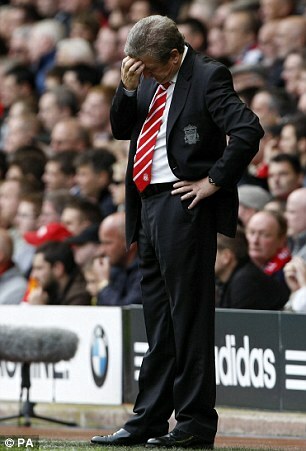 So as we all patiently wait for the January axes to fall on the likes of Liverpool’s Roy Hodgson (a mid-table guy), Aston Villa’s Gerard Houllier (he’s French), Avram Grant (an imposter), and — shockingly — Carlo Ancelotti (a top tier manager, though his players are certainly to blame)… remember that it’s not always their fault. Finding the right man for the job is likely just as easy as finding a needle in a very expensive haystack. Really interesting comparison, you fetch up the fact so earn.